A fearless female leader I look up to shared this image on her social media this morning, and I felt the need to now share with our Confidence Post community. It is so short but sweet! Whether you are in the 5th grade, in your 30s, or a grandma or grandpa, I think we all can be reminded and learn a lesson from the T.H.I.N.K. acronym. Words are so powerful and we don’t even know how much power (not necessarily in a good way) we have through the things we say. Our words have the potential to lift someone up or tear someone down. Let’s all pledge to be part of the first group — those community members who lift each other up whether in our classroom, after school, at work, in our groups of friends and peers, and at home. I know it requires us to slow down just a little, but please think before you speak and be thoughtful with your words! Is what you’re saying true? …and most importantly, Is it kind? 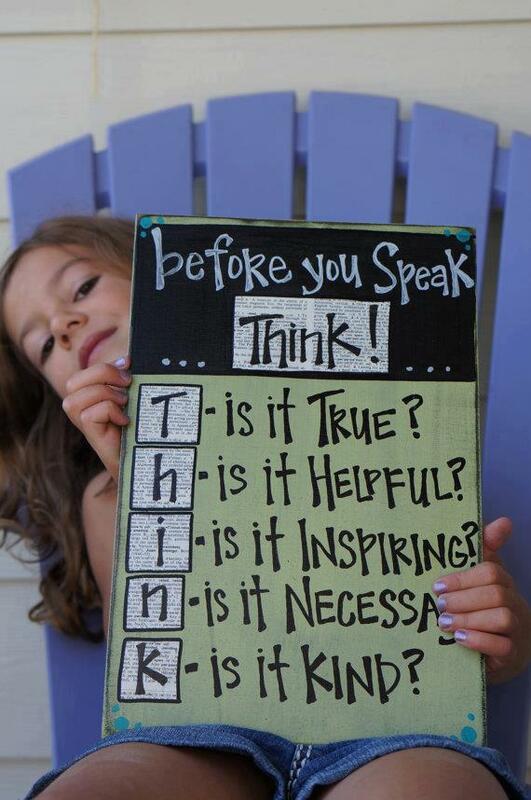 This entry was posted in Character Development and tagged #beinspiring, #bekind, #bethoughtful, #kindness, #kindnesskills, #think. Bookmark the permalink. Make A Healthy Lifestyle Choice: Drink Your Veggies!